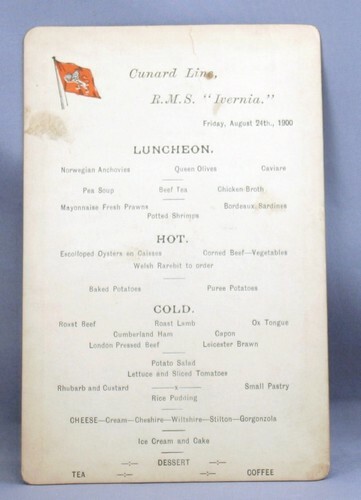 Luncheon menu from Cunard's RMS Ivernia dated Friday, August 24th, 1900. The front side presents the food selection. Rhubarb and Custard! The reverse lists available wine, spirits, other drinks, and tobacco products with prices. Havana, No. 1 cigar was 9d. The Ivernia was built in Newcastle, England and was finished in 1900. From June 1900 to December 1911, she sailed the Liverpool-Boston route. She was torpedoed and sunk near Greece on New Year's Day 1917 while being used as a troop ship. This menu is truly a piece of history. The menu is printed on lightweight cardboard and measures about 4 1/2 inches by 6 1/2 inches overall. Condition is very good for paper that is 114 years old! It has darkened with age and there are a couple of marks on the front (see pictures). Also it has a slight tear at the top.